Without a doubt, the most intriguing campaign we’ve seen in Universities yet – MI5 are looking to recruit the nation’s latest superspies into their Intelligence Officer Development Programme. Advertising on Tablewraps in Student Unions, MI5 are looking to capture the imaginations of students who might be considering alternative career options. The campaign is especially relevant in light of the fact that cyber espionage is one of the biggest issues the modern world faces and today’s younger generation are perfectly primed with the digital know-how and skill to combat it. 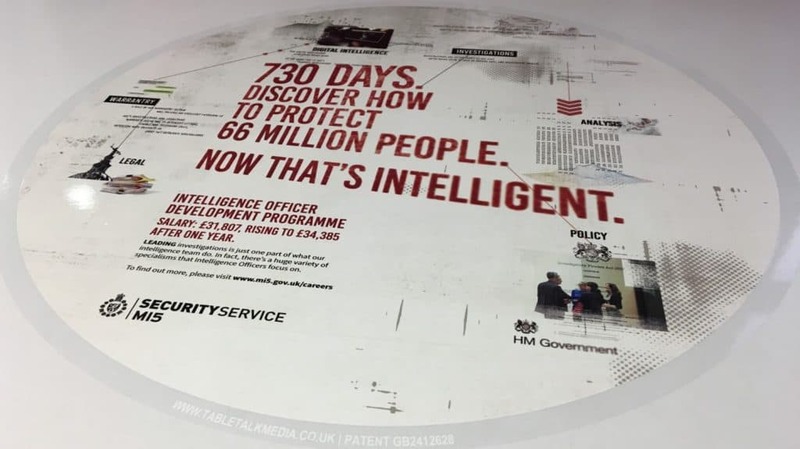 However the message advertised on University Tablewraps is cleverly tailored to appeal to a broad audience showcasing a wide variety of career paths beyond digital intelligence, from investigations and analysis, to policy, legal and warrantry. With MI5’s message placed on tabletops in University Student Unions where groups of students are often gathered together studying or socialising for extended periods of time, taking a break between lectures or getting work done, Tablewrap has the added advantage of placing the message in direct proximity to mobile devices, encouraging instant engagement with further content online. It’s a fantastic way for the Government to plant a seed and inspire the nation’s next generation of intelligence officers committed to keeping the UK safe.